The following article was written by our comrades of the Spartacist League of Australia. Indeed, it is not surprising at all that such fascist scum emerged from the cesspool of decaying capitalist society. The attack comes in a context of increased immiseration and capitalist austerity internationally. This has been marked by the rise in right-wing populism in Europe fuelled by anti-refugee hysteria, the vile, racist ranting of the U.S. president, Donald Trump, against immigrants, and a string of similar fascist attacks, from the 2011 massacre of social-democratic youth in Norway by Anders Breivik (“inspiring” Tarrant), to the 2017 shooting at a Quebec mosque, to last year’s massacre at a synagogue in Pittsburgh, U.S. The capitalist rulers around the world have shed crocodile tears over this tragedy, fully aware that not a day goes by without them massacring innocent people somewhere in the world. 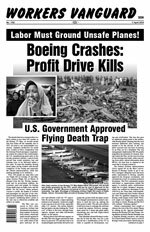 For the past two decades, in the name of the “war on terror,” over a million have been slaughtered by U.S. imperialism, backed by its Australian and NZ junior partners and other allies, as these forces occupied and/or bombed their way across Afghanistan and parts of the Middle East and North Africa. The U.S.-led imperialists have laid waste to entire countries, including Iraq and Libya. Today they continue to maintain military forces in Afghanistan and Iraq while helping to arm a Saudi-led military onslaught on Yemen that has turned that country into a slaughterhouse. The ALP [Australian Labor Party], both in and out of power, including when it was propped up in government by the bourgeois Greens, has pursued the “war on terror” in a neck-and-neck race with the Liberal/National Coalition as to who can be more fiercely nationalist and a better handmaiden to U.S. imperialism. While lording it over their respective patches in the southwest Pacific, both Australia and NZ also host U.S. bases which serve to militarily target the perceived enemies of U.S. imperialism. We say: Not one person, not one cent for the Australian imperialist military! Down with the ANZUS alliance [between Australia, NZ and the U.S.]! U.S. bases out! All imperialist troops out of Afghanistan and the Middle East! As part of whipping up domestic support for these wars, Muslims have been vilified as the “enemy within.” The Australian ruling class has long made a tawdry amalgam between the small Muslim population and terrorism while the bourgeois media has made it a patriotic duty to cast suspicion and demonise. Muslim communities have been repeatedly raided by heavily armed police, with families terrorised and young men dragged out of their homes and arrested on the flimsiest of pretexts. Dozens have been consigned to Supermax dungeons, often for nothing more than the ideas allegedly in their heads. This racism and xenophobia sits firmly on the bedrock of the dispossession and genocidal wars against Aboriginal people, Australia’s original “enemy within,” whose oppression continues unabated today. Alongside promoting interventions abroad and seeking to further divide workers along ethnic and religious lines by whipping up chauvinism “at home,” the “war on terror” provides a pretext for increasing surveillance and expanding the repressive powers of the state. While Muslims may be the immediate target, such measures are aimed at shredding the democratic rights of all, and ultimately have the left and workers movement in their sights. Down with racist “war on terror” government repression! Hands off Muslim minorities! Such racist bigotry has fuelled a fascist presence, including in Christchurch. Following the massacre, Muslims told journalists that they have long been targeted by skinheads and right-wing extremists. They have reported this harassment to the police but with no response. There has been increased police scrutiny of the Muslim community in the wake of the Christchurch attack. Make no mistake, when the cops go to the mosques, they do not have the protection of Muslims in mind. We say: Police out of the mosques! As Marxists, we vigorously uphold the right of armed self-defence and say the workers movement must defend the Muslim minorities. In Australia, the Liberal/National Coalition government has made an art form out of vilifying refugees and non-white immigrants. The Labor “Opposition” is no better. It was the [Kevin] Rudd Labor government that established mandatory offshore detention of refugees in the torture centres on Manus Island and Nauru. In the context of the recent parliamentary vote allowing for the medical evacuation of offshore detainees to Australia, the government railed against the supposed threat that these desperate refugees would pose and how they would displace “Australians” from hospital beds. We say: Close the detention camps! No deportations! Full citizenship rights for all who have made it here, including those on Manus Island and Nauru. Feeding into this toxic chauvinist climate has been the ongoing racist, anti-communist scare campaign against “undue” Chinese influence in Australia and the region, which has seen the introduction of sweeping new laws against “foreign interference.” Behind the “yellow peril” xenophobia is the desire of the capitalists to overturn the gains of the 1949 Chinese Revolution (see “Australia: Racist Outcry over China’s ‘Influence’,” WV No. 1134, 18 May 2018). The anti-China witchhunt is grist to the mill for numerous racist and fascist forces, including the Hitler-loving Antipodean Resistance who have campaigned to drive Chinese students off campuses. Much focus in Australia in the wake of the NZ atrocity has fallen on fascistic, former One Nation member, Senator Fraser Anning, who disgustingly put the blame for the attack on Muslim immigration. This is only the latest outrage from Anning, who in January attended a fascist rally at Melbourne’s St Kilda beach and in his maiden speech to parliament spoke of “The final solution to the immigration problem.” In response to his latest outburst, over 1.4 million people have signed a petition calling on the government to “assist in demanding a resignation” from Anning. Both the Liberal/National Coalition government and Labor Party opposition have moved to censure him. In wagging their finger at Anning, they seek to distract from the fact that his views are simply a distillation of the filth they have been spewing as part of their daily maintenance of the capitalist system. Any attempt to clean up the pigsty of bourgeois parliament is a crock. The biggest threat against working people comes directly from the capitalists and their repressive state apparatus—the military, police, prisons and courts. In response to the Christchurch attack, the capitalist rulers have bellowed about the need to crack down on “extremism.” While there may be a brief show of reining in one or two fascists, ultimately such measures will be used to silence and repress opponents of imperialist terror and capitalist oppression, not least those in the left and labour movement. We have long noted that the regulations behind the witchhunting Australian Building and Construction Commission, which targets the CFMMEU construction union for repression, were largely modelled on the early tranche of “anti-terror” laws. Both the NZ and Australian governments wasted no time seizing on the slaughter to bolster their plans to further censor the Internet. Now anyone in NZ with Tarrant’s manifesto on their computer faces up to ten years in jail! Declaring the Internet “ungoverned space,” the Morrison government has been in the forefront of a global push to force IT companies to better enable secret police to access the population’s private electronic communications. When they talk about censoring “hate,” what the capitalists really aim to do is silence those expressing justified class hatred for the bourgeoisie. Ardern has also seized the opportunity to introduce extensive gun control laws. Noting the failure of previous attempts to change the laws, she declared, “Now is the time….” The laws recall the widespread disarmament of the Australian population following the 1996 Port Arthur massacre. The slaughter unleashed in Christchurch speaks precisely to the need for the right of armed self-defence. Gun control is about depriving the working class and oppressed of the ability to defend themselves. The bourgeoisie, a tiny class of exploiters, sits atop great wealth and inequality. They seek to ensure the defence of their wealth and profits, extracted from the labour of those they exploit, by maintaining a monopoly on the means of violence in the hands of the capitalist state. As with Australia, NZ capitalism was founded on the conquering and dispossession of the Indigenous population. It was firearms that, in part, enabled the Maori to better defend themselves against British colonisation and during the New Zealand Wars. Today Maori are almost 15 percent of the population and form a critical component of the NZ proletariat. At the same time they suffer special oppression, including highly disproportionate levels of unemployment, homelessness and poverty and are targeted for racist state abuse and terror. In 2007 Maori activists were arrested on trumped-up charges using “anti-terror” laws. A key to the struggle to overthrow NZ capitalist rule will be the fight for full equality and justice for the Maori people. Maori communist leaders will be in the forefront of future revolutionary struggle. For Union/Minority Mobilisations to Stop the Fascists! The decaying capitalist order with its national chauvinism, economic crises, poverty-level wages and mass unemployment creates the conditions in which the fascists thrive. Distinct from right-wing ideologues, fascists are race-hate terrorists who seek to recruit, through racist violence on the streets, to their deadly program of genocide and ultimately the destruction of the left, trade unions and other workers’ organisations. They are held in reserve by the capitalist class to be unleashed as shock troops against the working class in times of crisis. It is in the direct, immediate interests of the labour movement to fight against attacks on minorities and to crush the fascist scum while they are small. As elsewhere in the world, fascists in Australia have been gaining confidence and strength, staging larger rallies with no effective organised working-class response. Rather than mobilise their ranks in class struggle, the union leaders have in fact contributed to the fetid anti-immigrant climate by pushing protectionist poison, which inculcates the lie that workers in Australia share a common “national” interest with their bosses. The union tops’ “Aussie jobs for Aussie workers” campaigns blame foreign workers for the bosses’ job cuts. Politically subordinating the organised working class to the capitalist state, particularly through fealty to the ALP, the union tops act as labour lieutenants of the capitalist class within the workers movement and as conduits for bourgeois consciousness into the proletariat. The ALP (like the NZLP) is a bourgeois workers party, a party based on the trade unions but with a pro-capitalist program and leadership. When in government, the ALP rules on behalf of the bosses. Any serious class-struggle mobilisation of the working class will require a political struggle against the nationalism and reliance on the state that is pushed by the current trade-union leadership. It is through intransigent political opposition within the unions to this Laborism that the proletarian base of the ALP can be won away from its pro-capitalist misleaders and a revolutionary Marxist party forged. The crucial task of sweeping the fascists off the streets requires a program for mass united-front mobilisations centred on the organised workers movement and uniting behind them all the fascists’ intended victims: Muslims, immigrants, Indigenous people, leftists, Jews and gays. Only the multiracial working class has the social power, organisation and objective class interest to stop the fascists and sweep away the capitalist system which breeds them. There are concentrations of unionised Muslim workers in the strategic Sydney transport system, while Maori comprise a significant component of the powerful construction union in Australia. United with their class brothers and sisters in struggle, these workers can be part of striking powerful blows against the capitalists’ divisive racism and send the fascists scurrying back down their rat-holes. To rid the world of fascism, immiseration and imperialist war will require a series of socialist revolutions to abolish the capitalist system. The stakes are socialism or barbarism. The Spartacist League fights to build the multiracial, internationalist, revolutionary workers party that is needed to make socialism a reality.